You may be eager to jump into a healthier lifestyle, but you have no idea where to start. Or maybe you have been doing a pretty good job, but have hit a plateau and cannot get through. Save this picture to your phone lock screen and look at it from time to time throughout the day. 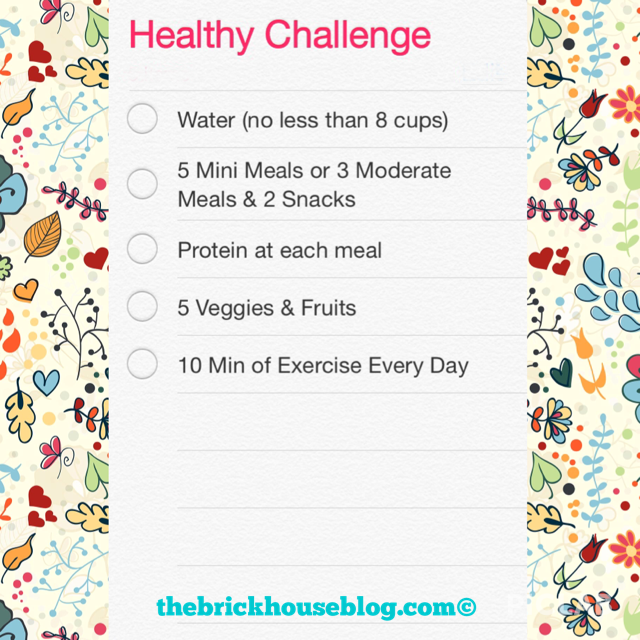 You may even want to use your reminders to set specific times for snacks/mini meals and exercise. Often when we set out to eat better and be more active we can either: a) not be specific about goals that we want to reach, or, b) set goals that are far too high in the beginning. We may have really big goals, like to lose 100+ lbs, but that is a long-term goal, and we need to master several small goals to get to the big ones. These 5 basic items are the framework for success. Along the way, you will learn more about the health benefits of different foods, and how to incorporate new activities. Our bodies are made of up to 60% water. Adequate water intake ensures that all of our cells are properly hydrated, mucous membranes, and joints are lubricated, and carries oxygen to every area in the body. Water also helps to regulate the feeling of hunger. Many times when we think we are hungry, we are actually in need of water. Shoot for no less than 8 cups per day. Moving away from the standard "3 squares per day," especially during weight loss, it is more effective to eat 5-6 mini meals, or 3 moderate meals and 2 snacks. This prevents your body from becoming too hungry between meals, and then overeating. Another thing this does is even out your blood sugar, and prevents the spike and plummet in insulin, which can leave you fatigued and hungry sooner. Be sure to match a protein and a carbohydrate form at each "meal." This could be in several forms: carrots & hummus, eggs with spinach and sundried tomatoes, natural peanut butter and banana, cottage cheese and salsa. Notice, I do not have a huge emphasis on grain. Whole grains are great: brown rice, whole wheat, whole oats, quinoa. However, it is important to choose items that are not made with undesirable items such as sugar high fructose corn syrup, MSG and processed, bleached grains. Being an avid label reader should be on your goal list. Do not rely on the manufacturers to serve you the most healthy options; they are partly to blame for our growing waistlines! Hit at least 5 servings of vegetables and fruits per day. Focus more on vegetables than fruit. They will contain a good amount of fiber, micronutrients and can fill you up very well. Fruit is not a no-no, however, the natural sugar in the fruit may cause you to crave sweet items in the beginning of your transition into healthy eating. Pay attention to your reactions and make adjustments as needed. When you feel hungry and frustrated (as you may experience) remind yourself that there is no limit to the amount of vegetables that you can eat. These can be roasted, steamed baked or raw. Challenge yourself to look for new veggies that you have never eaten before and get creative! And lastly, get yourself moving at least 10 minutes per day. Put on your shoes and walk the block, look on YouTube for a 10 min workout video. Just 10 minute per day is a minimum, however, you will see more success when you reach toward 30-45 minutes per day. Start small, but be consistent. Begin a fitness streak (created by SparkPeople.com) and ask a friend to join you! Each consecutive day that you exercise a minimum of 10 minutes, you add to your total. See if you can reach 14 days, then 30 days, and keep going! Your enthusiasm might just spark someone else to get fit! Consistency is the key! If you ever drop the ball, pick it back up and carry on! *Disclaimer: This information is offered as encouragement and should not be substituted as advice offered from trained medical providers. My Journey to Better Health! Staying On Track While You Are On The Fly!